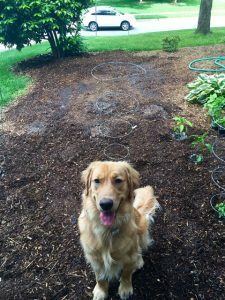 I didn’t want to title this blog “How to Start a Garden” because that already sounds too complicated. I don’t have time. I don’t know how to “garden”. I don’t have a green thumb. But I know vegetables need soil, water and sunlight. So let’s start there! Two years ago, I started with a small basil plant from the Farmer’s Market. This was my test run. Could I keep a single basil plant alive? Turns out, yes! I kept it alive and flourishing, enjoying delicious fresh basil all summer long. Just a little water, picking off the leaves to help it grow (and it use), and making sure it was in a place on the porch that got sunlight. Apart from just noticing the fresh taste, I saved so much money on that one plant compared to buying basil at the store whenever a recipe called for it. I was hooked. 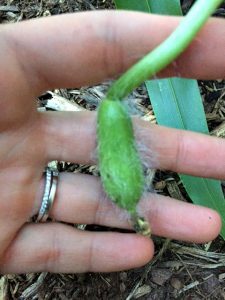 Tiny watermelon just beginning to form. 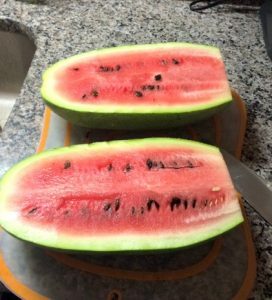 The single watermelon that survived! Last May, we decided to try to grow vegetables in addition to another basil plant. We visited a local nursery and they walked us through recommendations, plant needs, and what to try. It was so interesting! We found a small space in our yard and planted green beans, squash, tomatoes, red bell pepper, and watermelon. Yes, watermelon because why not try it (we were able to grow one small watermelon and it was delicious but it was a lot of work). We set reminders for ourselves to make sure we watered it when it hadn’t rained, and watched with awe as little plants started to pop up. Some of the plants made it, others did not, but overall we thoroughly enjoyed all aspects of having a garden; watching our work come to fruition, the satisfying feel of picking off a fresh vegetable, the great taste, the money saved, and having a fun project to do as a family. Small butternut squash just popping up. 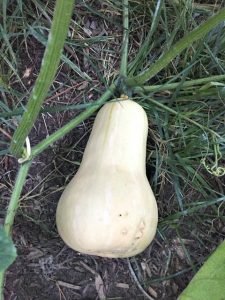 Full grown butternut squash right before it was picked. 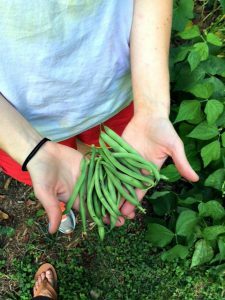 My husband doesn’t even like green beans, but he LOVED the green beans from the garden. Now that speaks volumes. Now we are back at it with more experience under our belt and a much expanded garden. 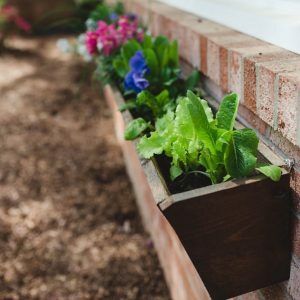 This winter we had two 6 foot window boxes bursting with different lettuce types and herbs (loved having fresh lettuce!). We have just transitioned them to flowers and herbs for the summer (basil, mint, lemon mint, oregano, thyme, parsley) and added four other windows have 6 foot window boxes full of flowers. 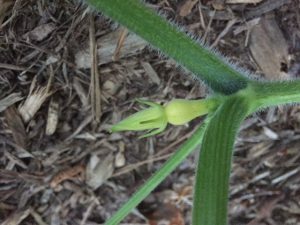 Our garden is underway with four tomato plants, two zucchini plants, two squash plants, two bell pepper plants, green beans (for the husband! ), and instead of watermelon, our fun “why not try it” vegetable is corn. Yes, stalks of corn. Are we in over our heads? Maybe. I am no expert, not even close, but my favorite things, and easiest, so far have been the tomatoes, basil, and green beans. I recommend starting small and working your way up, not to get discouraged if a plant fails, and to set reminders to water and check up on them. We will see how this year’s garden shapes up.. stay tuned for future updates! Do you have a garden? Or recommendations for me? Tips for others? Looking for a place to start? Whether you’re an expert or a beginner, share your thoughts on growing your own fruit and vegetables! Wonderful! Thank you James, please let us know how it goes for you!